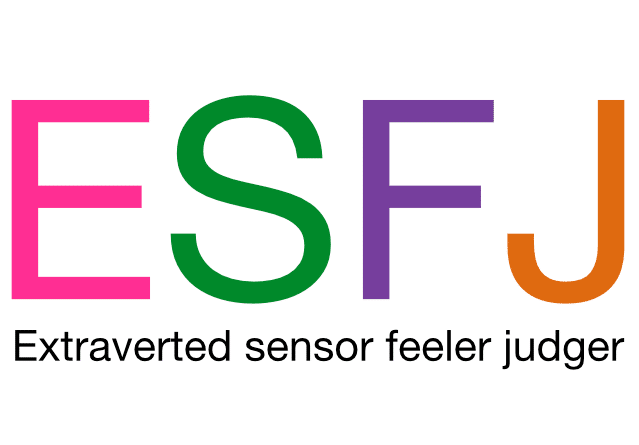 The Judger element of the ESFJ personality type means that feeling is extraverted with this personality type. 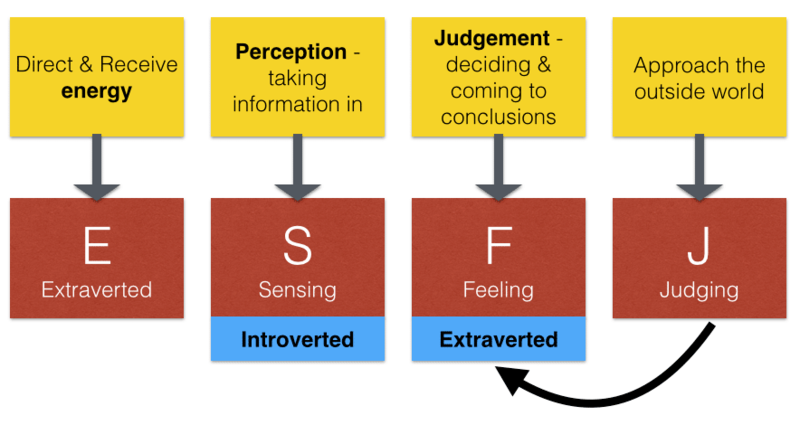 The preference for them in their processing is how they decide and come to conclusions (judgements) which in this case is through Feeling rather than Thinking. Helpful, warm and sympathetic. Co-operative, personable and tactful. Realistic, practical and down to earth. Consistent, decisive and thorough. Their dynamic is therefore Extraverted Feeling with Introverted Sensing. Their third preference is Intuition and their inferior function is Introverted Thinking. Timeline processes in NLP are particularly useful for ESFJs to help them lose the guilt hurt and worry. are supportive and show empathy. This person could come across introvert when you first meet them, but when you look closer I would put them in the more Extravert category. They are a hugger type person, and has a large data base of friends, and when we worked together at college, was a major part of the group, being very much involved and at the forefront of activities. Having said that, they tire easily, would go to bed early, and concentrate on one thing at a time as opposed to doing lots of things at the same time. They read a lot, and definitely in the here and now, and has qualified as a Mindfulness practitioner. They are kind, sincere and at the same time I would say a very kinaesthetic person. They are definitely in the middle of being a judger, perceiver in my opinion. They have issues with targets and goals, even though they are organised and on time. Plans are important to them, but not able to put dates by them as they get stressed easily. Lists are important to them, making many of them, but at the same time they keep their options open, as have difficulty with the stress of keeping to set goals. Julie is definitely extraverted. She would look to fill her spare time with being around people – she craves social situations. If she is on her own, she would want to be on the phone chatting. She’d be the one organising social situations – and they’d be in some high-energy, busy environment. As a friend, I would say Julie is a Feeler – she would put herself out there for other people and she likes things to be picture-perfect and harmonious. She’s kind and has firm values that probably central to her decision-making. However, what i know of Jane in the workplace is different – she craves power and, to get that, she would be more dissociated and objective. She’s firm-minded and “stands up for herself”. I’d say Julie is a Judger as she’s also highly organised, mostly on-time and very scheduled. In fact, she once sent me a list of diary dates for the whole year so she could be sure we saw each other regularly. Now, that is ordered!